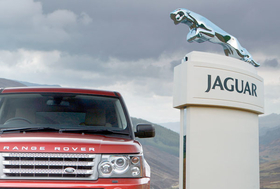 Jaguar Land Rover continued its strong growth in April. The revival of Jaguar Land Rover continued in April with global unit sales of the two British brands growing 61 percent, compared with the same month the year before. Jaguar Land Rover worldwide unit sales last month were 17,909, owner Tata Motors said. Jaguar sales for the month were 3,559, almost the same as last year in spite of the withdrawal of X-Type, Tata said in a statement, with Jaguar XF sales up 23 percent. Land Rover sales increased by 89 percent to 14,350. Jaguar Land Rover was hit hard last year when the luxury car sales plunged during the economic crisis. But Land Rover has led the company's revival, led by demand for updated versions of the Discovery (known as the LR3 in the United States) and Range Rover Sport. Both models were launched in 2009. Earlier this year former General Motors Europe President Carl-Peter Forster was named as CEO of Tata Motors Ltd. and former BMW AG and Ford Motor Co. executive Ralf Speth became JLR CEO. Last month, the company said it still plans to shutter one of its three UK plants, denying a report in the Sunday Times newspaper that the revival in sales, coupled with the arrival of a new management team, has led to a review of the closure plan. It said an announcement on production rationalization will be made by the middle of 2010.